First off, I'd like to say thanks for all the good wishes! 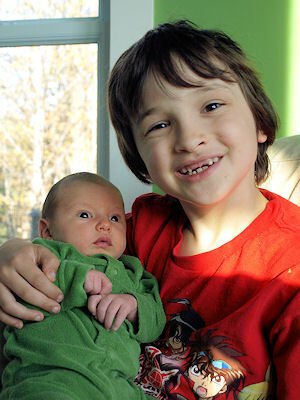 Not withstanding the expected lack of sleep we're all doing well. Of course it would be a grand understatement to say this hasn't been my month for cooking. Since Penny's birth I've been eating reheated meals from the freezer supplemented only by eggs fried by my husband. He's quite good at frying but for heaven's sake don't ask him to poach you one--and definitely don't offer him any advice while he's doing it! Even though I've been trying to take it easy I still wanted to attempt this month's Daring Baker challenge. 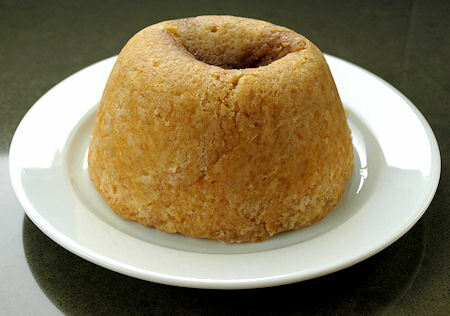 I've had steamed sponge (steamed cake) puddings before but not the type with suet crust and filling. Since our household is a dairy-free, meat-eating one I did try to procure some suet. But, since I'm tied down to the couch nursing I had to send my husband out--and the suet never happened. So a vegan pudding was to be. I chose to swap in extra virgin coconut oil for the suet and the recipe I picked was Sussex Pond Pudding. The citrus and caramel filling sounded like a good bet to please my son, whose favorite flavors are lemon and caramel. To make the recipe more my own I used a small bunch of kumquats in place of the lemon. They have been hiding in the bottom of a fruit drawer for long enough without any purpose. I also halved the recipe since I'm already trying to implement a post-baby diet and don't need copious leftovers tempting me. Well I loved the results!! The coconut oil worked very well, giving a flaky exterior crust with a spongy interior that soaked up just enough of the caramel sauce. The kumquats gave everything a beautiful aroma and I liked the bite of sour and bitter as a contrast to the rich and sweet crust and sauce. The best part was Alex couldn't be kept away once he saw the caramel sauce run out. He gobbled up his serving but left his kumquats on the plate. I was pleasantly surprised at how easy this dessert was. I didn't even have to fuss with the steamer! I just set it up and it was fine for the time needed. I can easily see myself playing around with this recipe and making it for dinner parties, when I'm ready for that sort of thing again. You could prep the pudding before guests arrive and have a piping hot dessert without having to run around the kitchen or worrying about anything getting over-baked. And somehow this spring I'll just have to find room in my diet to try the delicious sounding rhubarb version. Thanks Esther for the fun challenge!! Here are my adaptations to the recipe for Sussex Pond Pudding. 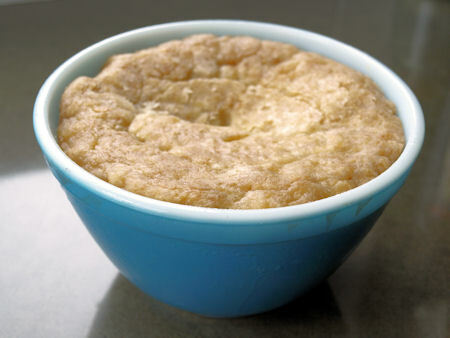 The original pudding recipe came from Esther of The Lilac Kitchen as part of the April 2010 Daring Bakers Challenge. -Find an appropriately sized heat proof bowl and prep a pot big enough to hold it for steaming. The steaming pot must be able accommodate the bowl along with a steamer basket or rack and have a fitted lid. -Mix together the flour, baking powder and salt in a bowl. With a pastry cutter or fork, cut in the coconut oil until it forms large crumbs. Add enough milk or water to form a dough. -Take three quarters of the dough and roll it out to a circle large enough to line the inside of the steaming bowl, the 2 cup heat proof bowl. Line the inside of the bowl with the dough. -Mix together the margarine and sugar and place half in the lined bowl. Add the kumquats or lemon half and cover with the remaining sugar mixture. -Roll out the remaining quarter of dough to form a lid. Pinch the edges of the lid to the lining and prick a vent in the center. 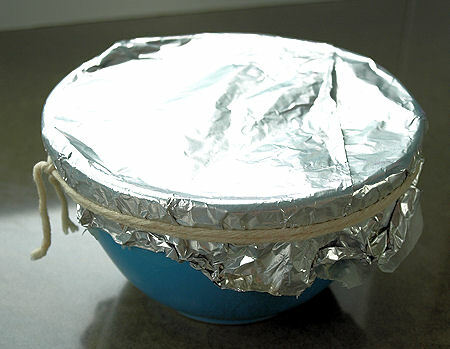 -Cover the steaming bowl with a layer of waxed paper combined with a layer of aluminum foil. Pleat to make a single expansion fold and tie tightly with string. -Get your steaming pot going and place the covered bowl inside. Steam for 3 1/2 hours, checking the water level occasionally. -Remove the bowl from the steaming pot carefully and take off the foil and paper. Invert a rimmed plate on top of the bowl and then quickly flip to unmold the pudding. -Our host this month is Esther from The Lilac Kitchen. 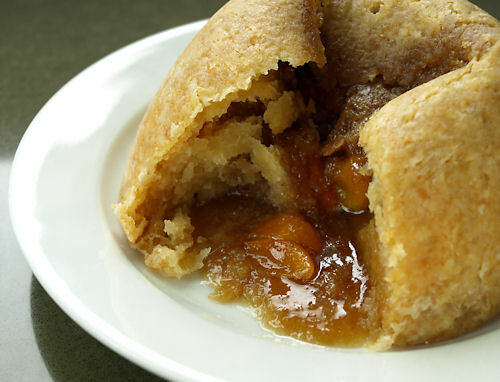 Visit her site for recipes for Sussex Pond Pudding and other suet-type puddings. -Esther based the recipes for this month from the following sources: Delia Smith’s Complete Cookery Course, The pudding club (www.puddingclub.com), Mrs Beeton’s Book of Household Management and the Dairy Book of Home Cooking and her own family’s recipe notes! -I used Tree of Life coconut oil this month and really liked it. It was a lot milder in coconut flavor compared to some of the other brands I've had. -Visit the Daring Kitchen and see all the other puds made this month by browsing the Daring Baker Blogroll.